The Heat Gun can be used for a wide range of applications. With high-end power of 2000W which are divided into three levels. The first level can reach a temperature of around 100°C. Level 2 will get to around 350°C and at level 3 an insane 600°C can be reached. An extra feature is three stable rubber feet on the back of the Heat Gun forming an excellent stand for hands free at work. They also provide safe way to store the gun after it has been used. This Heat Gun has an EU plug. If you need the UK plug please see article 1011151. Heat Gun, will it work in Australia on wall socket power and plug. 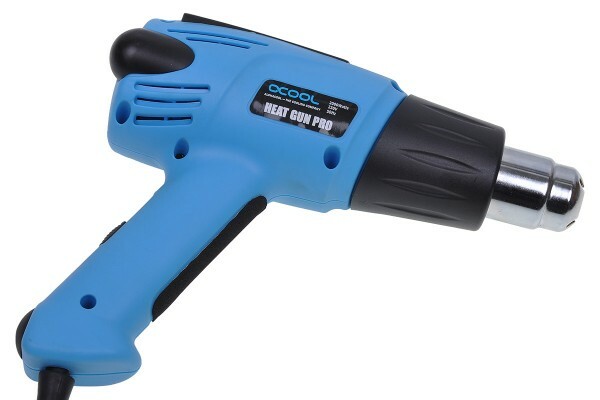 The Heat gun has only a EU and UK plug, you will need an adaptor to it in Australia. Nein, die Alphacool HEatgun gibt es nur mit DE und UK Stecker.